Citation Information: JCI Insight. 2019;4(4):e122130. https://doi.org/10.1172/jci.insight.122130. In vivo renal multiphoton imaging acquired after sham treatment and CA/CPR depicts vascular and tubular pathophysiology in early cardiorenal syndrome. 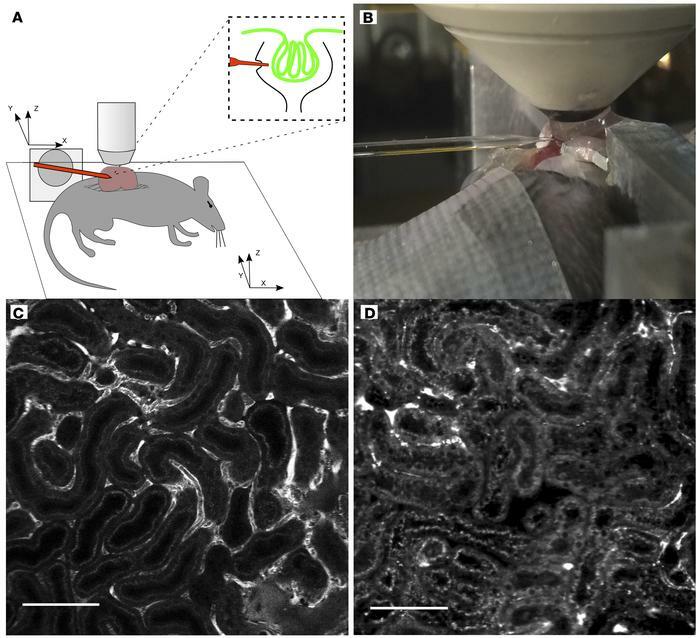 (A) Experimental preparation for multiphoton micropuncture. The kidney was partially exteriorized, immersed in agar, and immobilized with a metal, externally fixated frame. A glass coverslip, overlying the agar, provided a reference point and a stable surface for the water column, which completed the imaging interface to the microscope objective. The pipette tip positioning system was registered in all three planes with the microscope stage positioning system, allowing precision guidance to Bowman’s space of a preidentified glomerulus. (B) Photograph of imaging/accession procedure. The pipette is visible from the left, with the tip 30 μm below the coverslip edge. Partially exteriorized kidney, immobilizing frame, water column, and objective are all visible to the right. (C) Multiphoton image of superficial renal cortex 2 hours after sham procedure. Bright FITC-dextran signal visible in peritubular capillaries with orthogonal signal voids, which are due to red cell movement, indicating intact blood flow. Tubular cell bodies are not opacified, and autofluorescence demonstrates the brush border only. (D) Superficial renal cortex 2 hours after CA/CPR. Fewer FITC-dextran opacified vessels are evident, and they are smaller in caliber. Tubular lumens contain debris, and cell bodies exhibit increased autofluorescence, as does brush border, compared with sham. Images are representative of 7 experiments per condition. Scale bars: 100 μm.